Well before David Cameron announced the EU referendum, powerful, often shadowy foreign actors had been lobbying for years to install those who shared their vision of Britain’s future into critical positions of influence. Right-wing free-market fundamentalists agitating for Brexit secured positions in high office and the very corridors of power. Collectively, they established and built authoritative organisations to ensure that Brexit was not a wasted opportunity to push forward the next stage of the global reign of free markets. Thomas Piketty’s seminal book ‘Capital in the 21st Century’ stated that “no government programme could be sustained without an apparatus of justification.” This architecture, as Picketty asserts, is that without the think tanks, corporate lobbyists, disinformation and propaganda, false expert reports and spin doctors – change programmes such as Brexit would be politically unattainable. This book explains how, after connecting the dots, democracy came second in an EU referendum where subversive corporate forces facilitated by failed political protections overpowered Britain’s electoral system and overwhelmed it’s governing commission. This book names the bad actors in the ‘Brexit Syndicate,’ the transatlantic lobbying firms, think tanks and what turned out to be front charities. It brings to light ‘dark money’ and prises open some of their shameful, immoral and often illegal campaigns. Exposed in this book is a scandalous plan, long in the making to dismantle the welfare state and privatise the NHS with American corporations already secretly installed and writing public health policies in Britain. Uncovered is the story of how American corporations and lobbyists have unprecedented access to British parliamentarians looking to influence the outcome of Brexit in their favour. Also uncovered is another scandal, brushed under the carpet, about what the British pollsters knew and what they did with that information, and how some of Britain’s top business bosses have been gagged and openly threatened by government officials with job and business losses for speaking out against leaving the European Union. Brexit has always been sold to the public as freedom from the red tape of a failing EU bureaucracy and their meddling in sensitive areas of sovereignty such as immigration and judicial decisions that Britain escaped, not the destruction of public protections put in place to ensure civil society thrives. This book examines the language of Brexit, the illegal strategies, the scale and use of military perfected social engineering systems and the extent of international money pushed at ensuring Britain’s exit from the EU. There is a politically explosive question that has not been asked by the print or broadcast media; was Brexit both predetermined and then engineered as an outcome – this book answers that question. 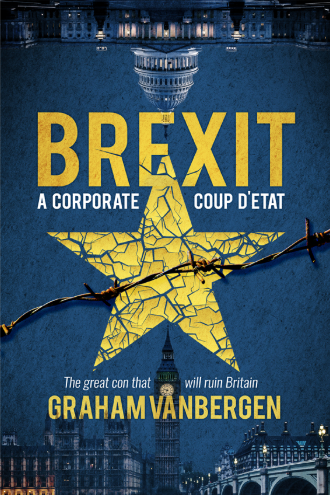 Brexit – A corporate coup d’etat is about what galvanised those in the know, the real motivations behind Brexit, how they did it and what we can expect in a future that was the result of the biggest corporate coup d’etat in history.